October 17th, 2015 (2:00 pm), Maki Kasai (Sax), Kyonga Im (Vlc) and Maki Ono (Pno) will premiere my work 黒い花びら [kuroi hanabira] for tenor saxophone, violoncello and piano at the headquarters of Pasona in Tokyo. This poem describes a moment in the underground metro station in Paris in 1912. 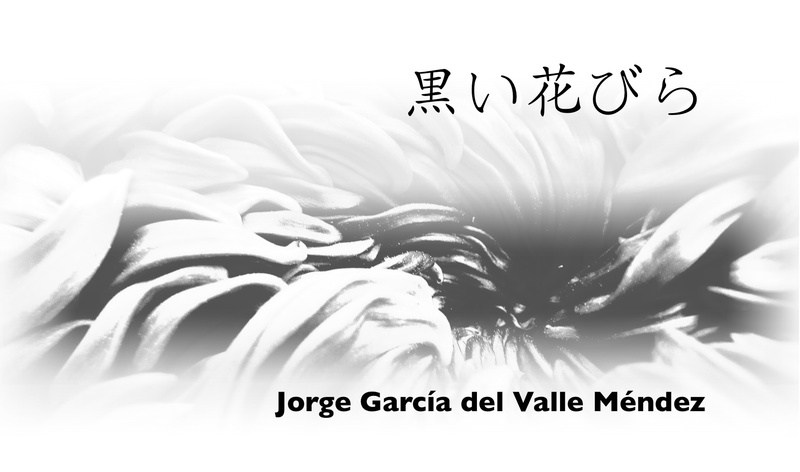 Pound don’t describe the faces of the individuals in the metro but put them into the poem with an image: black petals. Therefore, it is considered an imagist text. Pound may have been inspired by a ukiyo-e print by Suzuki Harunobu: “Woman admiring plum blossoms at night”, and and probably attempted to write haiku-like verse. I was fascinated by this image or “graphic metaphor”, so I wanted to translate it into a sound impression. But in 黒い花びら I didn’t translate the meaning of the poem but the image it suggest: black petals (faces) hanging on a bough (metro train). The darkness and anonymity of the image will be expressed in a short form with a single static element delimited by small gestures which define its contours. Everything happens very fast without leaving a trace. 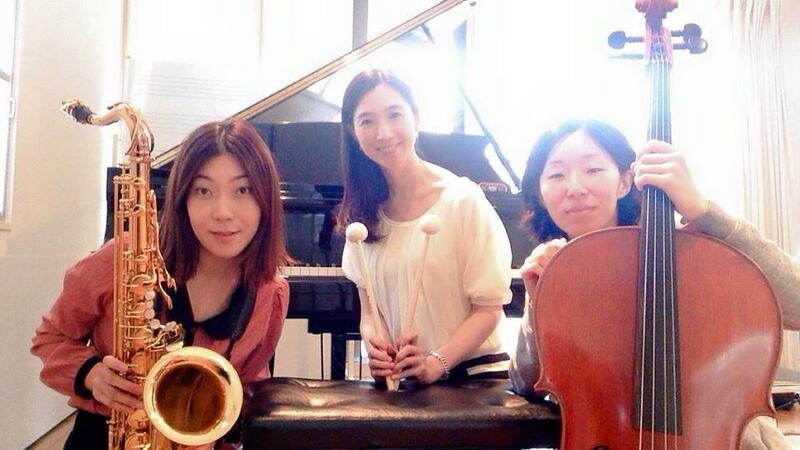 This work is dedicated to Maki Kasai, Kyonga Im and Maki Ono. My work “no sun, no moon” for bass flute and electronics has been selected for the EMUFest International Electroacoustic Music Festival 2015. 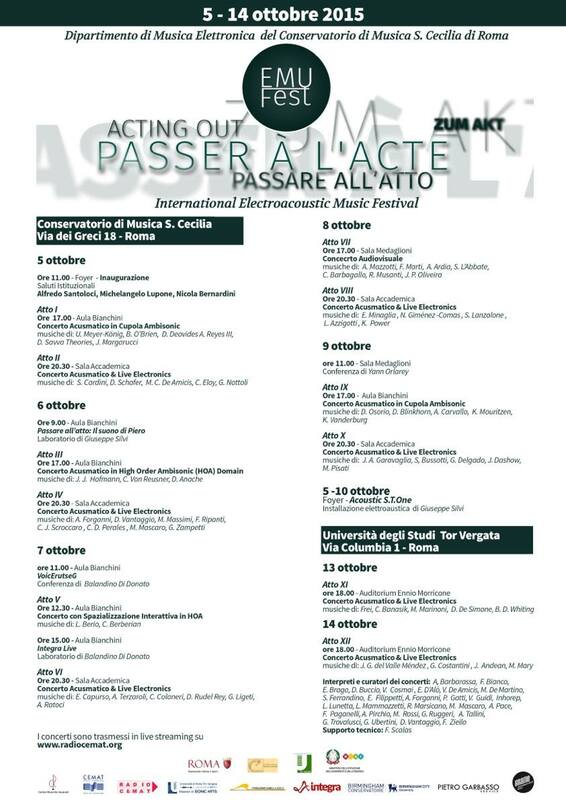 This festival will be held October 5th to 14th this year at the “Santa Cecilia” Conservatory of Music and the Università Tor Vergata in Rome. “no sun, no moon” will be performed October 14th at the Auditorium Ennio Morricone in the Università Tor Vergata in Rome. This time the flutist will be Alessandro Pirchio. Do not hesitate to go to the concert if you are going to be in Rome! 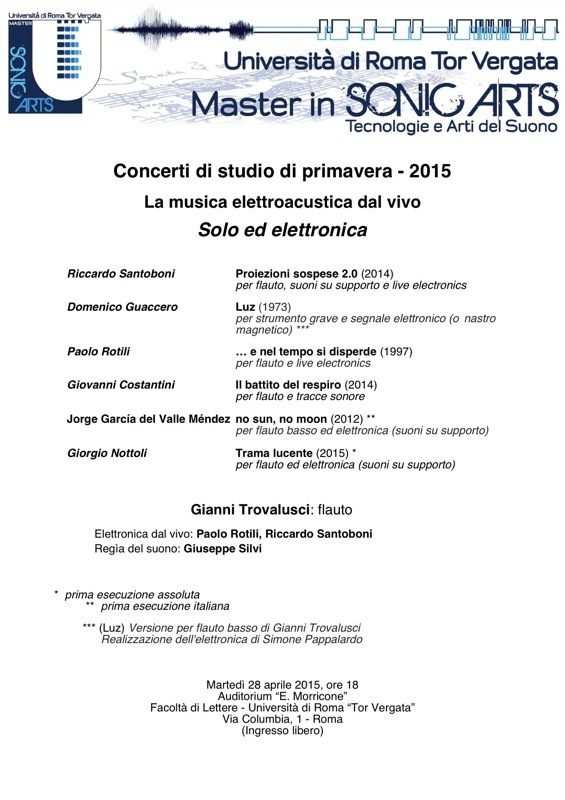 The next Thursday, June 25, 2015 (3:30 PM, Concert 15) Gianni Trovalusci will perform my work “no sun, no moon” at the NYCEMF 2015 (New York City Electroacustic Music Festival). The concert will be at the Playhouse in the Abrons Arts Center, 466 Grand St, New York, NY 10002. The NYCEMF is dedicated to showcasing the best electroacoustic music and video art from all over the world in New York City, through a multi-day festival. 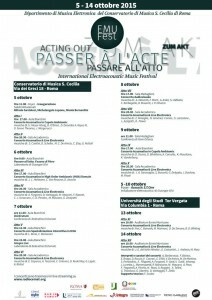 The festival includes electroacoustic music recorded alone in up to eight channels, works involving live electronics, works combining musical instruments or voices with recorded or live electronics, video and multimedia works, and audio and video installations. This festival will take place June 21-28, 2015 at the Abrons Arts Center and other locations in New York City. My piece “no sun, no moon” combines the bass flute with fixed media electronics. The flutist can “read” the electronic, which is notated in the score, and follow it. The result is a sort of “chamber music” where one part is alive and suitable for interpretation and micro-changes, while the other (the electronic) is fixed and can not be changed. The work plays with different virtual acoustic spaces and the relationship with the real one on the stage. The composition and creation of the electronics has been made exclusively with recorded samples of the bass flute. In this way I create a relationship between the two parts of the work: the real one (flute performer) and the virtual one (electronic). Do not hesitate to hear Gianni play my piece if you happen to be in New York. It’s going to be an awesome concert! 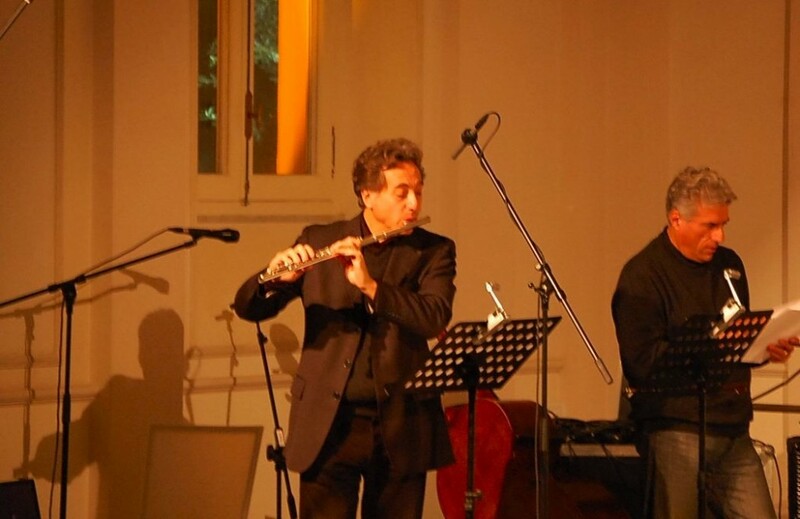 The next Tuesday, April 28, 2015 (18:00), the italian flutist Gianni Trovalusci, specialized in the field of contemporary music, will perform a concert at the Auditorium “E. Morricone” in the Università di Roma “Tor Vergata“ (Rome, Italy). He will include in the program my work “no sun, no moon” for bass flute and electronics. 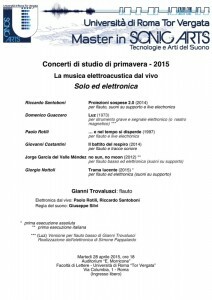 This concert is part of a series called Concerti di studio di primavera, which takes place at this university as part of the Master in Sonic Arts. 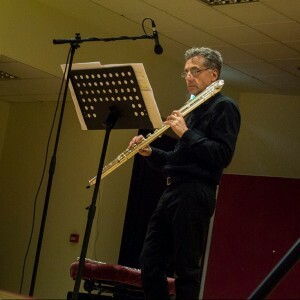 Giovanni Trovalusci will perform pieces from different composers that combine the flute with distinct forms of electronic: live electronic, tape and fixed media (computer). Trovalusci has been active since the 70s in the field of contemporary music, in music theatre and avant-garde performance. He has worked with many artists in this area. 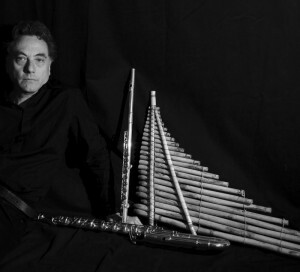 His musical research has led him to discover parallel artistic areas and traces, like theatre, dance and poetry, as is evidenced by the wide range of instruments adopted: modern, classical and ethnic flutes, new specially designed instruments and live electronics. Do not hesitate to go to the concert if you happen to be in Rome! Kari Johnson will play my work “Visions of the void I” for Piano and Electronics the next Thursday, January 15 at 7:30pm in Hart Recital Hall at the UCM (University of Central Missouri). Do not miss it if you’re going to be around!